There was a house on the way to my grandma’s that had a door like this. As a kid, I found it funny. 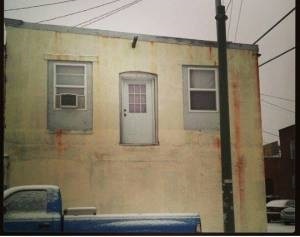 Why put a door on the second floor with no way to get there? We used to make up stories about it as we passed. This was one of my favorites. – George, time to put the stairs back in place, you old coot. – Nope. Damn kids’ll sneak out again. You know what they’re like. Sinners! Gadabouts! Trouble makers. – Hon, the “kids” are over 21. Put the stairs back. – Hazel, they made a fool of me one too many times. They want to live under my roof, they use the front door like the rest of us. Hazel knew without some partyin’, her kids would never marry and move out. She’d always be stuck between. Dragging the ladder under the door at dusk, Hazel sighed. Better than one of ‘em breakin’ a leg. Cute story! I enjoyed reading this. A pragmatist. Good one Erin. Over 21 and still living at home? Jump for your lives, kids! I was a practical parent and it worked out well. You’d think she’d learn carpentry. Anything to get the kids out of the house. Very well written. I found myself thinking about being in that situation and came to the conclusion that I’d either move out myself or grab some boards and a hammer. Funny story. I like the sneaky mum. I think if I was Hazel I’d be climbing down the ladder myself. Fun story. You can’t always catch them; best to be pragmatic. Smart mom. If the kids are over twenty-one it’s time for them to move out. 😉 Clever story.